WAAPA provides a cross-disciplinary learning environment where students have many opportunities to collaborate and create new and exciting work. From the composition student writing music for a contemporary dance performance or the soundtrack to a short film, or the classical pianist performing in the pit with the orchestra for the mid-year musical, there is something new to be found around every corner. For the seasoned performer there exists the opportunity to refine your skills further before entering the professional world. The diversity of performance groups and ensembles at WAAPA reflects the world of opportunity awaiting prospective students. Decibel is a new music ensemble based in Perth, Western Australia devoted to performing works that explore the nexus of acoustic and electronic instruments. Pioneering unique electronic score formats and giving electronic music instruments a voice in the acoustic space, Decibel also arrange electronic works for live performance. Decibel are committed to Australian music and emerging Western Australian composers, as well as sharing important international works with Australian audiences. WAAPA’s award-winning Defying Gravity percussion ensemble creates a new world of sound - where sparkling rhythms and seductive melodies mix with an astonishing array of percussion instruments from around the globe. Defying Gravity is one of Australia's longest-established and most active new music ensembles, and has developed a national following through its broadcasts on ABC Classic FM. Directed by Tim White (WASO's Principal Percussionist for 28 years), Defying Gravity has played at the Percussive Arts Society's International Convention in the USA, performed throughout Australia, and featured at the 2011 CHOGM Opening Ceremony. Defying Gravity’s performances combine exotic timbres with melodic beauty and the overwhelming power of rhythm - plus all the fun of 'Stomp'! LINK Dance Company is the graduate-dance-company – unique in Australia – based at WAAPA. LINK closely replicates the range of activities experienced in a small contemporary company. Dancers attend daily company class, rehearsals, fulfill production responsibilities and negotiate funding issues to facilitate the annual European tour. WAAPA is renowned for its world-class jazz program and the 18-piece WAAPA Big Band is a wonderful example of the high standard of Jazz we have over here in the West. 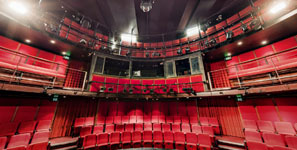 The WAAPA Big Band regularly perform on campus, in the Music Auditorium and in the larger, Geoff Gibbs Theatre, as well as at the annual WAAPA In The Park event which regularly attracts thousands of audience members, as well as Fremantle Direct at the Fremantle Arts Centre and engagements in the eastern states and overseas. The WAAPA Big Band swing their way through a winning selection of jazz hits along with new works by WAAPA's Composition and Music Technology students. Make sure you come and see Australia’s finest young jazz artists pay tribute to this incredibly rich musical genre and walk away with a swing in your step.